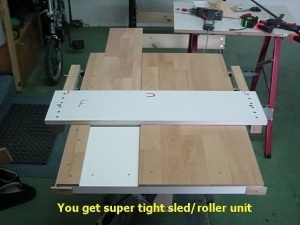 Homemade router table featuring a panel doubling as an integrated sled. A companion roller unit provides additional versatility for positioning workpieces. Sorry...I read through this twice and read what was printed...and really like the tight sled idea and can see the value in the roller set-up...but I still don't get how this works with the router in real life. The "hole" shown as the example, doesn't help me. Can someone explain, for example, where the workpiece goes in relation to the router blade? Thanks.